CARD 2 - BLUE CARD - I cut the background die again, this time I used Black cardstock. I then snipped into the die cut and used them to stick onto the front of my Ink background to create a fancy background look. Again I embellished my card and added a stamped sentiment. Inky background, I used a Die cut sentiment and embellished the card with small pink enamel pearls. 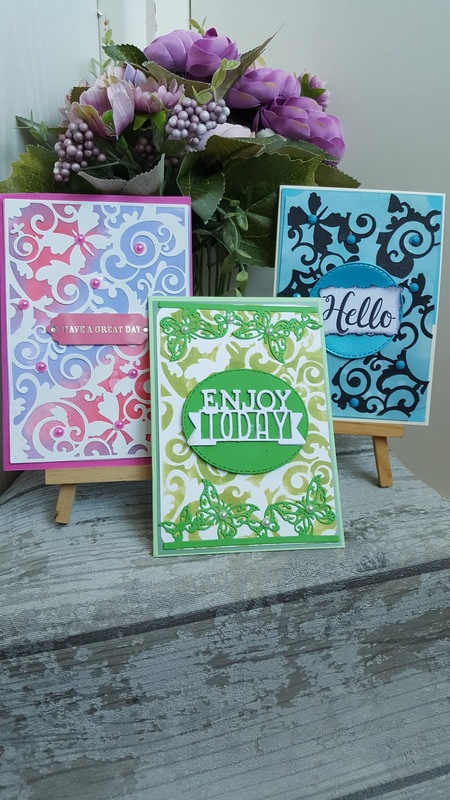 I really enjoyed making these 3 cards it was nice to see how my die could be used in different ways. I am hoping that the lady who requested me to do the video will be happy with the cards that I made. If you would like to take a look at my You Tube tutorial I will leave a link below.